A 30-year-old man was admitted to the emergency department (ED) after developing acute onset chest pain and difficulty breathing. A chest X-ray suggested a loose left C6 screw. The patient had previously undergone C6-7 anterior cervical discectomy with fusion (ACDF), 18 months prior to admission, for a large C6-7 herniated nucleus pulposus on the right side and severe C7 radiculopathy. He did well for many months. In the five to six months prior to admission, he complained of increasing neck pain and some swallowing difficulty. He was found to have a pseudoarthrosis and was initially treated nonsurgically. His symptoms worsened, however, and a cervical spine radiograph two months previous demonstrated a 2 mm back-out of one of the top screws. A posterior cervical fusion/revision was planned before the patient presented emergently. When the patient presented to our ED, a radiograph revealed that the top left screw at C6 had come out completely. Frontal and lateral radiographs of the neck demonstrated prior C6-7 ACDF with displacement of the left C6 screw into the prevertebral soft tissues approximately 3 mm anterior to the C7-T1 intervertebral disc space and approximately 2.7 cm inferiorly displaced from its original position. There was prevertebral soft tissue swelling with free air concerning for abscess (Figures 1 and 2). CT neck with IV contrast demonstrated enhancement along the right longus colli muscle as well as a rim-enhancing collection that extended inferiorly approximately 8 cm from the level of C6-7 along the esophagus. 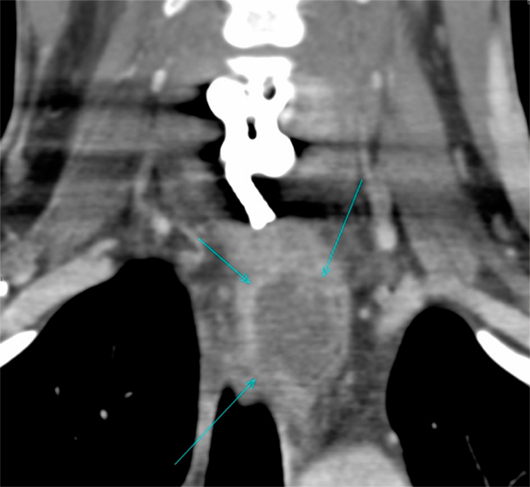 Coronal reformatted image from contrast enhanced multidetector CT of the neck revealed a rim-enhancing fluid collection at the level of the thoracic inlet displacing the esophagus laterally to the left (Figure 3). 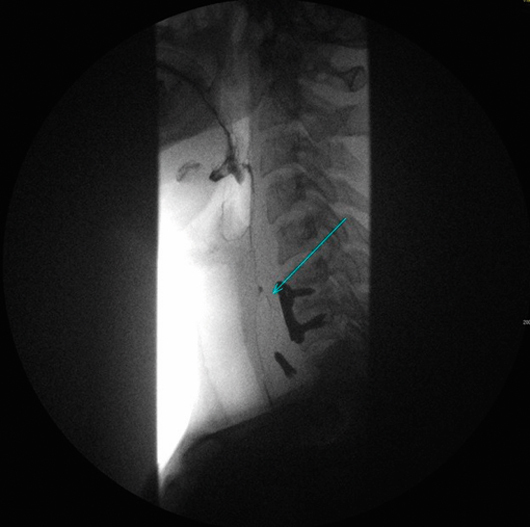 A cine-esophagopharyngogram on the same date demonstrated extravasation of contrast at the C6 level compatible with esophageal perforation/fistula (Figure 4). 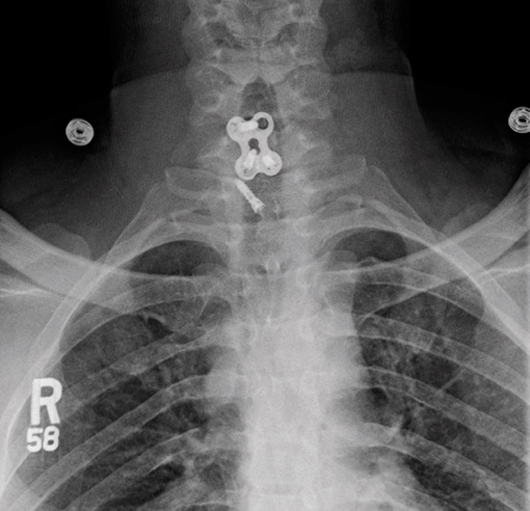 Late esophageal perforation after anterior cervical discectomy with fusion complicated by hardware migration. IR performed a CT-guided aspiration of the abscess the following day, and a gastrostomy tube was placed for long-term enteral nutrition. 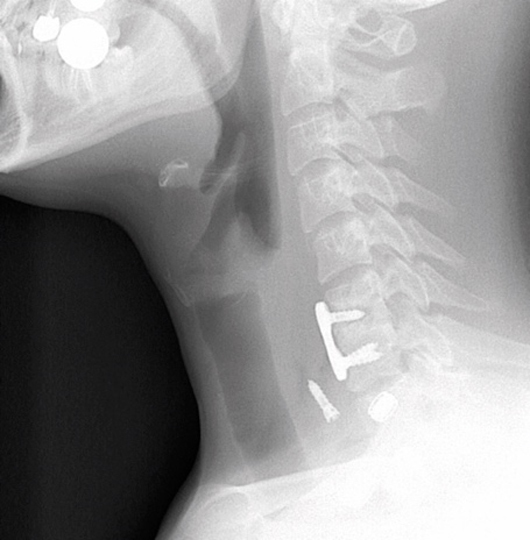 Several days later, C5-T1 posterior cervical fusion was performed, and two days later a radial free-flap repair of the esophageal perforation with irrigation, debridement, and removal of anterior cervical plate and screws was completed. The patient did well after surgery and was discharged home on antibiotics. In most cases, esophageal perforations can be divided into three groups: intraoperative, early postoperative (within 30 days of anterior spinal surgery), and delayed.1 The most common complaint after anterior spinal surgery is dysphagia, with some describing rates between 2% and 67%.1 In the best setting, dysphagia resolves over time. At our institution, we see many patients with dysphagia following ACDF but far fewer with actual perforation of the esophagus. It is important to be vigilant for possible complications after anterior cervical spine surgery, since some surgeons do not follow their patients for longer than one year following successful surgery.1 There are reports of patients presenting up to 18 years postsurgery.1 Also, symptoms of hardware loosening/migration and possibly esophageal perforation can be nonspecific. In our case, the patient experienced dysphagia and neck pain initially, which progressed to right arm pain and, finally, sudden acute chest pain. Plain radiography may suggest loosened hardware, migration of hardware, prevertebral soft tissue swelling, or free air to suggest the possibility of abscess.2 At our hospital, both CT and nonionic contrast swallowing studies are commonly used to detect esophageal perforation, sometimes followed by MRI and endoscopy. — Margaret M. Fynes, MD, is an attending radiologist at Johns Hopkins Hospital. — Nathaniel E. Shalom, MD, is a radiology and molecular imaging resident physician at Johns Hopkins Hospital. 1. Halani SH, Baum GR, Riley JP, et al. Esophageal perforation after anterior cervical spine surgery: a systematic review of the literature. J Neurosurg Spine. 2016;25(3):285-291. 2. Yang SY, Lee SB, Cho KS. Delayed esophagus perforation after anterior cervical spine surgery. Korean J Neurotrauma. 2015;11(2):191-194. 3. Ahn SH, Lee SH, Kim ES, Eoh W. Successful repair of esophageal perforation after anterior cervical fusion for cervical spine fracture. 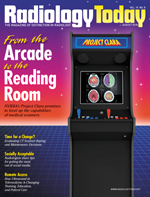 J Clin Neurosci. 2011;18(10):1374-1380. 4. Amhaz HH, Kuo R, Vaidya R, Orlewicz MS. Esophageal perforation following cervical spine surgery: a review with considerations in airway management. Int J Crit Illn Inj Sci. 2013;3(4):276-278.